Are you wondering if a Husky Poodle Mix puppy is right for you? 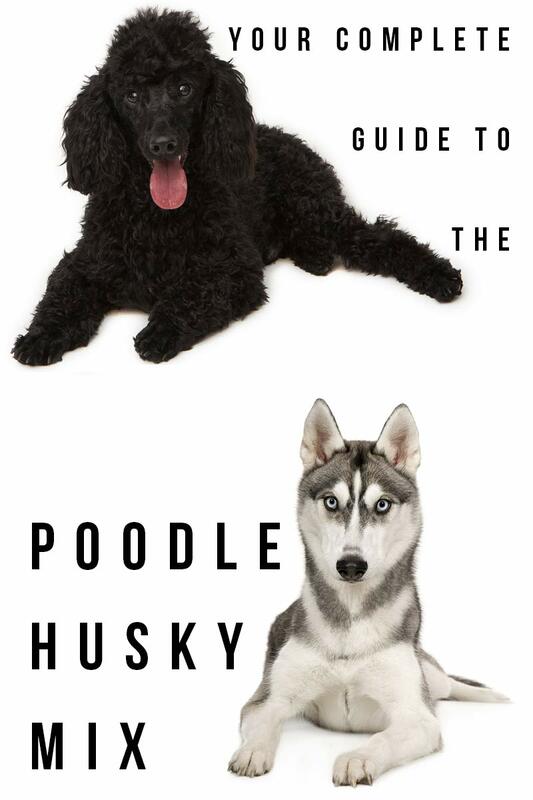 Welcome to our complete guide to the Husky Poodle Mix! The Husky Poodle Mix is the result of a Husky cross Poodle. This fascinating mixture of a husky and a poodle has many names – huskydoodle, huskypoo, poosky, and siberpoo. Not surprisingly, this cross-breed has just as much variation in appearance as it does in names! The last few decades have seen the rise of “designer dogs,” a loaded term that simply refers to a cross of markedly different dog breeds. Oftentimes, a designer dog is the result of two pedigreed parents. The Siberian husky and poodle mix has been at the forefront of the wave of designer dog popularity because it’s sturdy build and high average intelligence make it a great companion. Although traits can never be guaranteed in a cross breed, a husky mixed with a poodle has the potential to be a great combination. Husky x Poodle usually requires less intensive grooming, which is a big plus for people who don’t have a lot of time. Of course, the most influential reason for their popularity is no doubt the appearance of the husky-poodle mix puppies – there is no cuter pup. No matter the topic, whenever changes occur, there will be people who oppose them. Sometimes they have an interest in maintaining the status quo; other times they stand to lose something from changes. Dog breeding is not immune to this phenomenon. Not long after we domesticated dogs, people realized that if you bred a dog with specific characteristics, the offspring were likely to have that trait, too. Fast forward thousands of years and repeat this process millions of times – the wolves we befriended now appear as chihuahuas,Great Danes, and everything in between. It’s important to remember that every dog is the exact same species of animal – Canis lupus familiaris. So where do pedigrees come in? People who really loved dogs (don’t we all?) got together and made clubs- kennel clubs- which decided to categorize dogs into breeds using (arbitrary) characteristics to define that breed. In order to maintain the imagined purity of the artificially-created breed standards, they began to curate lists of dog husbandry. In order to have a “real” Siberian husky or a “real” poodle, it has to have parents that are registered on one of these lists. Ultimately, a pedigree is a piece of paper. It has little to do with your dog’s health or happiness. For centuries, there were two kinds of dogs: pedigreed purebreds and mutts. This worked out well for dog breeders – they registered their dogs with kennel clubs and so their litters were pedigreed pups that could command high prices. However, in order to maintain the purity of the breed, pedigreed dogs undergo a lot of inbreeding. That is, they mate with closely-related dogs – oftentimes members of their immediate family. We don’t do that as humans because we recognize that it often leads to health problems because of genetic depression . We know that there is strength in diversity – and that is doubly true for genetics. Which brings us to the topic of hybrid vigor. There is a myth perpetuated that hybrids, especially in the first generation, are somehow weaker and more prone to illness than pedigreed dogs. In fact, it’s the exact opposite. Centuries of inbreeding has produced common health issues in pedigrees. The stunning Siberian husky is prone to several eye-degeneration diseases. Furthermore, the body types of dogs like chihuahuas or bulldogs practically guarantee they will have brachycephalic airway issues. Mutts, and more recently, designer dogs, alleviate some of these issues by adding genetic diversity that helps mitigate innate health issues and slightly altering body types to less extreme conformations. Don’t let anyone tell you that designer dogs are less healthy. That’s wrong. Science will back you up. The Siberian Husky isn’t actually a wolf hybrid, despite its looks. The breed first appeared in Siberia as a working dog bred by the Chukchi people. Its primary duty was to pull sleds laden with walrus meat from the hunting grounds back to the village. Huskies have maintained that noble profession of sled pulling for thousands of years. They rose to prominence in 1925 when they delivered crucial medicine to the Alaskan town of Nome, saving the town from being wiped out by an intense diphtheria epidemic. The Poodle, despite being associated with France, is a breed that is thought to have arose in Germany for hunting waterfowl. They’re among the best canine swimmers, even though we normally think of them as prim and proper show dogs. Poodles are known to be highly intelligent and active. They can reach a level of training and socialization superior to that of some other breeds, which contributes to their public perception as pretentious and snooty. Since the Siberian husky and poodle mix is not purebred, there are no records of the breed’s origins – official or otherwise. It’s likely that many breeders began to produce them at the same time when designer dogs started gaining traction. It’s important to remember that there are no guaranteed traits in a crossbreed. The appearance, behavior, health, and all other traits of a huskydoodle puppy is inherited randomly from both parents. It might have the startlingly blue eyes of a husky, or it might not. He or she could have the poise of a poodle or the derpy “talking” that makes huskies so adorable. It could have both, or neither, of these traits! For that reason, it’s difficult to generalize about designer dogs and crossbreeds. There are characteristics that tend to be a combination of both breeds, rather than just being picked from one or the other. Size is one such trait. A huskydoodle will grow to be a large dog, anywhere from 45-60 lbs and 14 to 25 inches tall. Both of the parent breeds are well-built, active dogs, so you should expect the same from the crossbreed. Their coat is usually multi-colored with markings, especially on the head and chest. They tend to stay on a spectrum of black to white, and grey is a frequent color as well. While huskies often have erect ears, the ears of a huskydoodle are almost always floppy. Their noses are invariably black, but that shouldn’t come as a surprise. A husky crossed with a poodle is a like asking for an espresso with a caffeine booster – it’s a lot. They’re very smart and very active. It’s not the kind of dog you can leave at home in a kennel all day. They make great working dogs – a huskydoodle would not be out of place as a service animal or working on a farm. A crossbreed like this will require a lot of attention, so make sure you’re able to give it. At the same time, huskydoodles are almost catlike in their ability to lounge. Expect your dog to be lazy when you’re available and bouncing off the walls when they want play time. A husky-poodle mix will always be loyal to its family. They also like to form strong bonds with one person. Since they are a generally friendly, happy cross, you can expect them to be sociable around strangers that don’t emanate bad vibes. Also like their parents, huskydoodles can be obstinate and stubborn. It will require a firm hand to ensure obedience. As mentioned previously, crossbreed traits are hard to predict and impossible to ensure. In regard to huskydoodles, though, there’s a trend of having the coat markings of a husky and a fur quality similar to that of a poodle. Huskies have what is a called a “double coat.” The top layer of the coat is called the “guard layer” – it has long thick hairs that allow the skin to breathe, but protect the layer beneath. That bottom layer, or undercoat, has thick, soft hairs that trap heat. The undercoat is shed a couple times a year, depending on temperatures. A huskydoodle may or may not have the double coat of a husky. It will probably adopt the wiry, curly hair of the poodle, though. 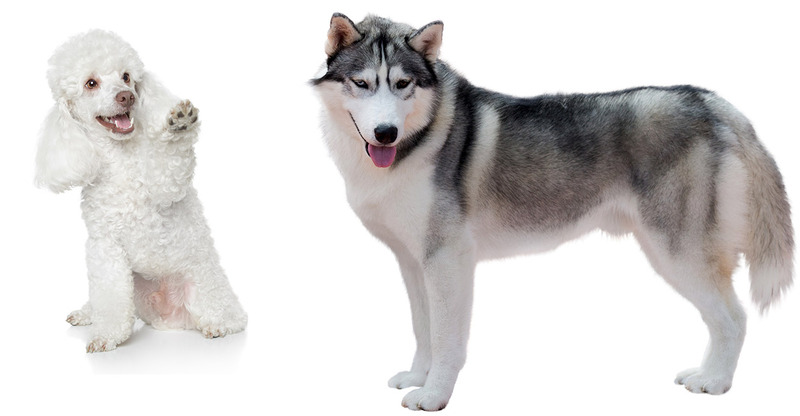 While both of the parent breeds are dogs that require intensive grooming, the huskydoodle tones that down a bit. You won’t ever need to shave them like you might for a poodle (and you also don’t need to make your huskydoodle look like topiary). You won’t have to give your dog a trim in the summer like a husky requires, because regular brushing should be sufficient. That being said, they are prone to matted coats – a trait passed on by their poodle parent. This can be avoided by brushing regularly with a wire brush. That activity makes for some good bonding time, though, so enjoy it! Is the Poodle x Husky Hypoallergenic? Technically, no dog is 100% hypoallergenic because all dogs produce some amount of dander. People like to tout poodles as being hypoallergenic, but it’s not entirely true. Their curly fur does tend to capture shed hairs and dandruff, which reduces the amount of allergens in the air. The requisite brushing and shaving, though, releases them and can cause allergic reactions. Huskies are, of course, very rough on people with allergies. The huskydoodle presents a happy medium – the curly hair reduces dander, though it is still present. If you’re too sensitive to the allergens to have a husky, but really like that aesthetic, the huskydoodle might be for you! The huskydoodle has a lifespan of around 10-13 years of good health. A proper diet and exercise can extend this period. When trying to predict health issues a crossbreed (or designer dog) might have, you look to the parents. Both huskies and poodles are known to frequently suffer hip dysplasia, so you can anticipate mobility loss in the later years of a huskydoodle’s life. That hip issue is the only major overlapping medical problem the breeds share, though, so it’s the only one that is still probable. As a crossbreed, your huskydoodle will benefit from “hybrid vigor” – he should be healthier due to the increased genetic variation. Also watch out for skin problems like irritation or rashes. These generally arise as a result of improper grooming. Stay on top of it and your pup will be fine! Both dogs are known to be high-maintenance in several regards. Notably, they require advanced training and socialization. Large dogs have the potential to cause a lot of damage to objects and people, so you need to be able to depend on their training. Frankly, huskydoodles aren’t a great choice for first time dog owners (and neither are huskies or poodles). Training can be a long, difficult process for these breeds. Start while they’re young, because their attitude (and capacity for destruction) only increases as they age. Ideally you should enroll in obedience lessons within a few weeks of getting your dog – those lessons also help establish your dominant role in the relationship. Since they can be stubborn and have short attention spans, frequent training for short durations is a good strategy. Use lots of praise and rewards to convince your husky-poodle mix puppy that listening to you is worth his time! Daily exercise is a must for the huskydoodle. Ideally, they should get between 45 minutes and an hour of active, outdoor time. They need space to run around and stretch their muscles. An apartment is a poor place for a big, active dog like the huskydoodle. They really need a backyard of some kind, even if it’s small. Daily walks to a dog park are a good substitute. Kill two birds with one stone and enroll in some agility classes! They get your dog moving and also help instill obedience. Plus, it’s really cool when your dog can do tricks people have never seen before. Is the Poodle-Husky Cross a Good Family Dog? Is the Husky Poodle mix a loyal, protective dog? Absolutely. Is it a patient dog? Not always. Neither huskies nor poodles are known to be very tolerant of the poking, prodding, and tugging habits of infants and small children. They’re not a big fan of surprises or sudden, loud noises. Huskydoodles are quite similar in this regard. If your house has young children, it might behoove you to look into other, more kid-friendly, breeds. Of course, if you train your dog (or your kids) very well, it will never be an issue. Generally speaking, though, it’s better to be safe than sorry. Since designer dogs are all the rage these days, you should have no problems finding a husky-poodle mix. Check out specific crosses like a toy poodle-husky mix, or a mini poodle mix. With the tag “designer dog” you are unlikely to find one for sale for less than $500. Prices can reach up to $2000 – suspiciously close to that of “superior” purebreds! Be sure to do a thorough background check on the breeder you consider. Find reviews from third parties or sources you trust. Since you’re not concerned about pedigree, you can consider a wider variety of breeders. Be sure to meet the parent dogs if possible to get an idea of temperament and appearance. Inquire (and verify with a vet if possible) about the medical history of the parents. Always have your puppy tested at a vet for current health and congenital problems, especially if the breeder says it’s not necessary. That’s a suspicious thing to say. Even if the parents were the picture of good health, it’s important to make certain you’re getting a healthy puppy. The Siberian Husky. The Happy Puppy Site. The Standard Poodle. The Happy Puppy Site. Wills, MB. 1997. A review of the progress in canine hip dysplasia control in Britain. Journal of the American Veterinary Medical Association. We have a 9 month old 90 lb St. Berdoodle (St. Bernard and poodle mix) and he’s the best! They truly don’t shed and both my husband and 1 of my kids are very allergic to dogs. They almost never need allergy meds with him. I’m on this site because I’m looking at other doodle breeds…because, I don’t know…Sebastian might need a “sibling” and I don’t want another quite as large 🙂 He’s very obedient but we had him go to a private trainer for boarding for 3 wks when he was 4 mos old. People can’t believe he is only a puppy when he’s so well behaved. Love the poodle mixes and will always look to get one! I can not wait for our newest member. They will be born in 3 weeks! 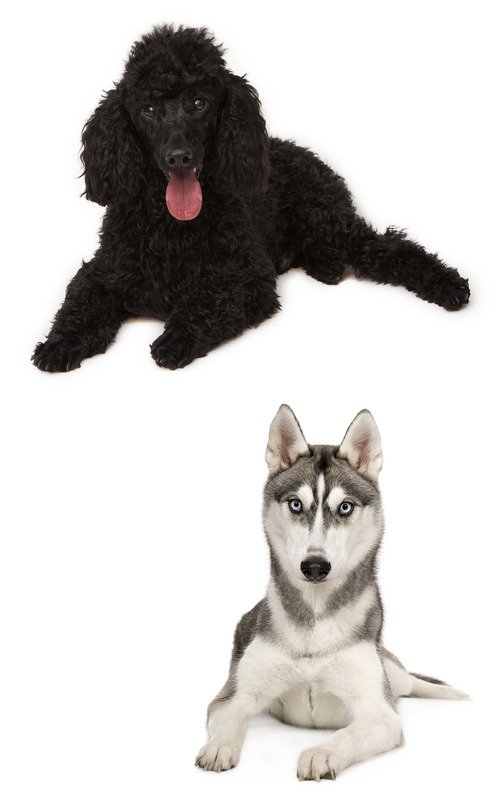 The mother is a white husky/lab with blue eyes and the dad is a black standard poodle. So excited! Did you ever find the contact information of a husky-poodle mix breeder? My daughters desperately want one. Thanks in advance. Michelle, are you saying you may have a Siberpoo litter soon! Where do you find this mix? I’ve been searching for months and no reputable breeder has come up. Anyone know of any?